Mr Petal & Pins and I finished the Australia Day long weekend with a late lunch on the deck. 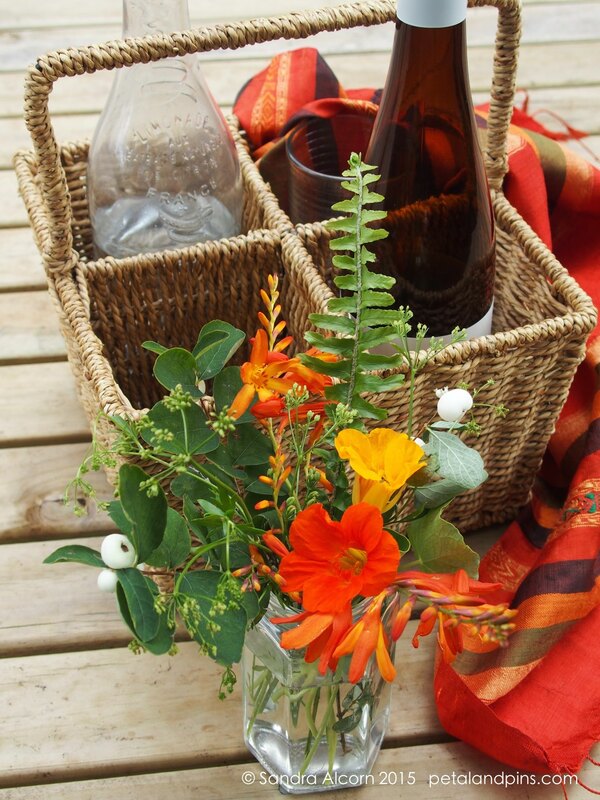 I like to arrange flowers in old jars for alfresco dining – even if it’s just the two of us! For this arrangement I picked some nasturtiums, crocosmia, a sprig of snowberry, a fern leaf and some parsley flower buds. 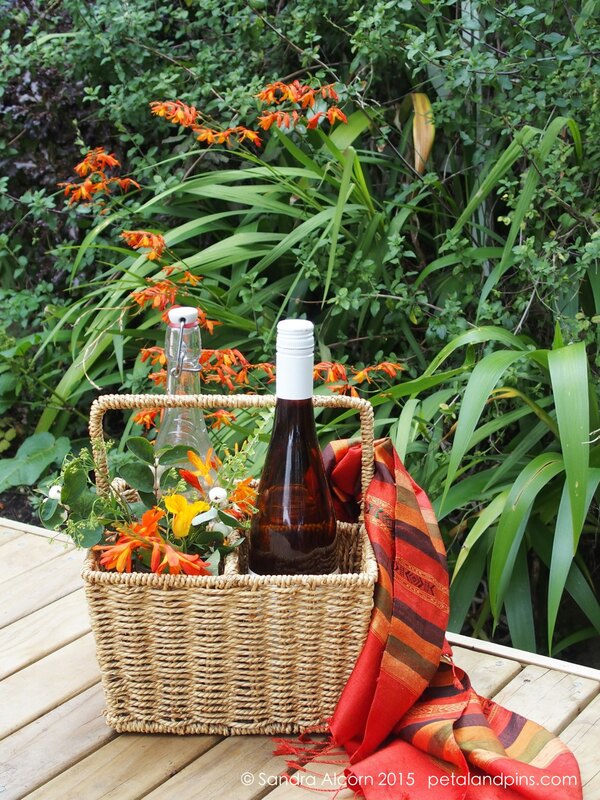 So today I’m joining Cathy from Rambling In The Garden for ‘In A Vase On Monday’ with my picnic posie. Cathy started ‘In a Vase On Monday’ as a weekly ritual of bringing something from the garden inside no matter what the season and invites you to do the same. It’s always lovely to see what’s flowering in other people’s gardens and their arrangements. My Garden Fairy’s Wardrobe has both a nasturtium dress and a crocosmia which you can see here and here. And my picnic posy now graces the kitchen table. They do spread quickly and are considered a weed here – you see them growing a long the road and around creeks. I thin them out every now and then. flowering well this year but we have had rain they do tend to not flower from lack of water but ounce back which is probably what makes them such a weed in Australia – but such a lovely splash of colour. Ok I will link to my dresses when my vase contains the same! That’s really interesting about the nasturtiums – and I meant to ask you about the the snowberry as it seemed a little incongruous to see them at the same time as the nasturtiums, but I suppose you are heading towards your Autumn now. Thanks for the opportunity of seeing more of your fairy dresses! Still a bit of summer to go but they’re also growing in a sunny spot, I think the snowberries are early as well. 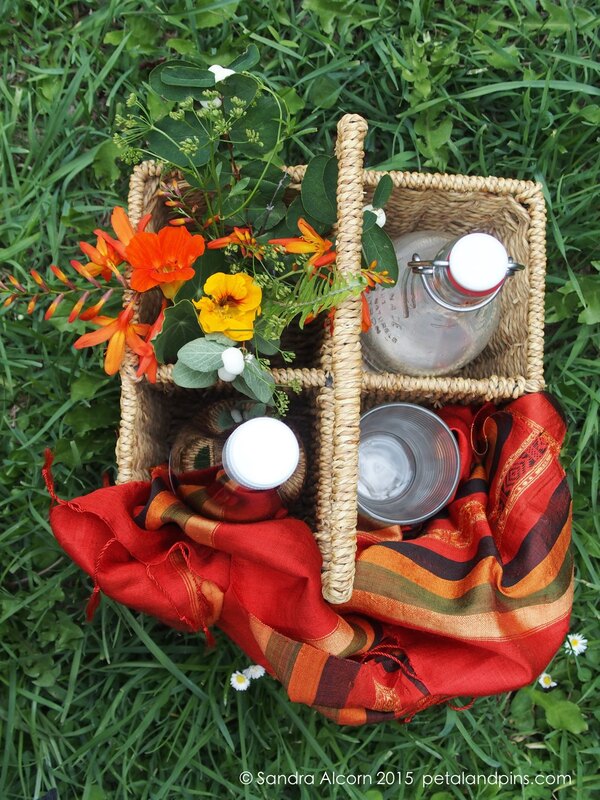 Beautiful posy and what a nice touch to your picnic.